Hi, Patrick! How was your Christmas? Mine was just great! This is Neil Camera's Wacky Cameras holiday card for 2018. Hey Patrick, everything all right with you? I haven't heard from you in a while and I'm starting to wonder what's going on here. My Christmas and New Year's were great! Again, how were yours? How goes the a's and c's? Are you almost finished? I take it back! Not only are you almost finished, but, as usual, you're doing a great job yet again! I never knew that so much work had been done here while I was out! *...without copyright. Both variations are equally common; therefore, neither one is more valuable than the other. (858 & 904). This is a known fact, so I'll leave it up to you as to how it's written out. *...either "mr. Goonbar" or "mr. Goober" (1048) Never even noticed this one, did you? *... (glow in the dark version) (2650) Since 2627 is this, this one-and any future Wackys of the 1970s glow in the dark versions of the Aurora Monster Models (if any)-should be this, too. *"Mystery poster" only available as part of a complete set purchase (3904) This is just to be the same as the Halloween Plaques section. *...by toppsvault.com... (3407) Is this an actual correction or am I just imagining it? *Artist contributions from:... (4324-4332). The "With", I think, is unnecessary here. It should be this, with the other part still saying Gag contributions from... .
Also, both 418 & 1200 need to be reduced from two rows down to one. By this, I mean that there's a space above the text in both of them that needs to be taken down just a little bit. Good break and good holidays. I think I started in on all the a's and c's but didn't quite finish, so I hadn't made a 'all caught up' post. But, it's mostly caught up. there were a few things I was deciding on, like how best to include the Wacky DVD project and some of the patch discussion too. I'll probably have time this weekend to get to the rest, as I have an unexpected mandatory 3 day weekend due to the current gov't furlough situation. Patrick, I've got an idea as to how to put in the info on the unmade Wacky DVDs into the ANS4 section. Just remove all the Notes on Lost Wackys that need to be removed and then you can put it in at the beginning of the section. The only ones that you need to keep on the Spreadsheet are 947, 987-988, 994-1003 and 1013. UPDATE: I see that you've removed all of the unnecessary Notes except for two-933 and 991. That's good! As soon as you remove those two, you can do this. Also, I think that 2794 and 2795's Notes should be combined into one Note and placed in 2795, since promo card NS3 appeared before the Bio postcard did. Therefore, the Note would then be: Same product as ANS10 but different design; given out at the Philly Non-Sports Card Show (2795). Plus, the aforementioned real name should also be placed in 2795, as shown above. *Maxwell House Regular Grind Coffee (4217). Finally, Promo should replace Bonus in 4058. This one's a little bit longer, Patrick, so I'll put it here. Topps should be added to the beginning of the real name of all of these: 171-172, 192, 251, 344, 355, 416, 444, 491, 494, 533, 621, 711-712, 719, 886, 979, 1041, 1139, 1156, 1246, 1341, 1442, 1457, 1526, 1670, 1705, 1878, 1937, 2420, 2477, 2503, 2560, 2575, 2590, 2615-2616, 2673-2675, 3558, 3858, 4062 & 4298. By the way, are Push Pop and Juicy Drop Pop labeled as Topps products also, like Ring Pop is? If they are, please let me know and I'll add them in here, too. UPDATE: They're Topps products, all right, so I've added all of them. I've also added all the Baby Bottle Pop ones on the grounds that I think that that's a Topps product, too. Patrick, I found something that could possibly be added to the Non-Topps section. 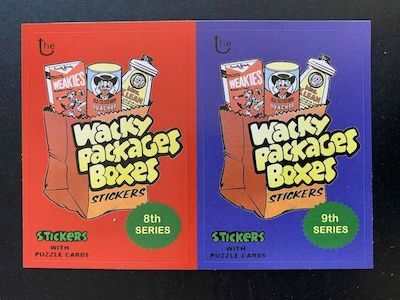 I was looking through Greg Grant's website and found four series of a homemade, unofficial product called Wacky Packages Boxes, which are stickers of paintings of some of the various boxes (filled with packs, of course) that Wackys have had over the years. This doesn't seem to be something that Matt Stock (who, as far as I can see, doesn't seem to be well-liked around here) is involved with, but if I'm wrong, please tell me. Could these series be added in at all? The box stickers are produced by Greg and Matt. They are not paintings, they are photos of the actual boxes (with photoshopping). *Puss 'n Boots Whiskers Cat Food (3392) (by the way, Puss 'n Boots was a real cat food brand back in the day). Next, there's no dash after Wacky Packages/Wacky Package in these products: 192, 979, 1878, 1937, 2503, 2560, 2616, 2673-2675 and 3858 and there's no dash after Garbage Pail Kids in these products: 1041 and 1705. For example, the non-sticker products would be Wacky Package Posters, Wacky Package Tattoos, Wacky Packages Postcards, etc. Godzilla: King of the Monsters (2019)/Enoz Moth Balls (2192). Next, both this real name - Keebler Club Crackers - Original - and this Note - Same product as ANS10 but different design; given out at the Philly Non-Sports Card Show - should be in 2795. The reasons for this are given in Reply #881 above and, once again, this should be done, I think, for the sake of consistency. If you could get these in, that would be it for now. Thanks! Patrick, I think that all the Notes from the OS run, ANS run, etc., that I got from lostwackys.com that are based on roughs (i.e., the ones that say "Originally intended for...", etc.) that need to be removed should be removed. I think that you're right in this case; it's only just so much clutter here. Thanks, Patrick and Dave, for telling me about the WP Boxes sets (I only saw four series, though, Patrick). I take it that Matt Stock doesn't have many friends here, if any at all. Now, Patrick, what I'd like to know is: which boxes in which series were the fakes? Let me clarify here that not all the Notes need to be removed. The ones that should be kept are Notes that say that a Wacky was meant for one series but was published in another, known facts about any Wacky-based subject, etc. I'll leave it up to you, Patrick. I know that that part is in good hands. I believe the Irish Whiskeys (3392) is actually Whiskas cat food (not Whiskers), and have updated accordingly. The first season did not have the dash between Scooby and Doo, whereas it's always there later on. And from what I see when looking at any online source, when written, the title always contains the comma, whereas the title shown on screen does not. I did some clean up on the multiple Clubbeds. I'd like to find out who the artist is for the ANS10 B7 Clubbed, to add that tidbit, since we know George Wright did the postcard version. Thanks, Patrick! I'm in Georgia now and haven't got any access to the Spreadsheet, but I'll look at it when I can. *Puss 'n Boots Whiskas Cat Food (3392). Plus, you forgot to remove all of the dashes from the real names of the Wacky Packages and Garbage Pail Kids parodies. *Topps Planet of the Apes (1974-75 TV series) (416) - it should say this in order to distinguish this trading card series from the other two Topps Planet of the Apes trading card series-the one for the 1968 first film version and the one for the 2001 second film version. Also, the 1974-75 TV season is what is mentioned here. *Nabisco Lorna Doone (1128) - another cookie/cracker product that I forgot (and hopefully the last one, too). It's been added to Reply #787 on 7-11-18. *Altoids - Peppermint (1773 & 4296) - I think that these two are right. However, if they're not, please adjust accordingly. Good work on the Clubbed Crackers Wackys! However, 2795 does need a double row in the Notes section. I'll keep you posted if I find anything else, of course. I just saw on ted's Wacky Packages Plus on eBay that the Boxes card sets have gone up to six series. Thanks for telling me this, Patrick! I only saw six when I looked at the site. I guess that they're not lacking for boxes, obviously. Are there any other fakes in the mix besides the two that you mentioned? You also said that a 9th series was "apparently planned for" - and then you stopped there. Were you going to mention the year that it was planned for, or am I mistaken here?